Southern California has just added another arrow in its quiver of clean energy. The state can feed power into a storage center of Tesla batteries by day to supply its grid when the solar panels go to sleep. 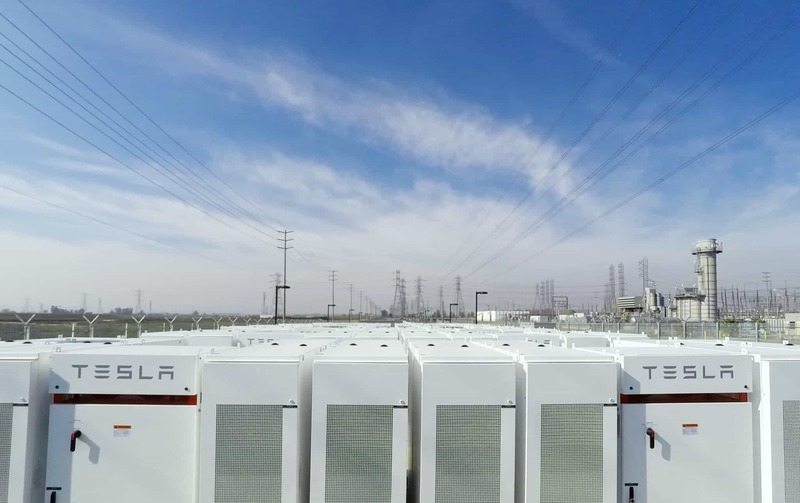 Tesla battery packs awaiting to be unleashed upon California’s power grid. If you have too much of something, why not bottle it up for a rainy day? Well that’s what California is planning on doing with their power. The state’s Public Utilities Commission has installed 396 refrigerator-sized stacks of Tesla batteries with impressive haste just off a freeway in South California. Capable of powering 15,000 homes for over four hours, the battery packs will be tasked with sucking up any excess juice from the grid when production is high and feed it back to consumers when needed. The installation will officially come online on Monday, and showcases how utility companies can use storage mediums in lieu of conventional systems, with round the clock production. California has been an ardent pursuer of clean energy to combat climate change. But in doing so, the state has also turned traditional energy patterns on their head — California has excess energy during the day when its plentiful solar panels are churning out energy. But with most of the state’s nuclear plants either closed down or in the process of being shut down, strict environmental regulation, lack of space for new plants, and a growing distrust in peakers (natural gas plants) after the 2015 leak at the Aliso Canyon gas storage facility, the conventional generation system is struggling to pick up the slack at night. When the sun sets and people come home from work, production figures plummet at the same time demand rises sharply. True to their clean energy efforts, the state has been exploring ways to use that excess energy rather than limit solar production. Usually considered too costly elsewhere, battery storage offered a solution since its price is comparable to peakers in California. Ironically, these Tesla-made batteries were manufactured, shipped, and installed for the Southern California Edison company. They’re hooked up at the Mira Loma substation in Ontario, roughly 40 miles east of LA. The whole process took three weeks to complete — a very impressive feat. “I had relatively limited expectations for the battery industry in advance of 2020. I thought that it would not really accelerate and begin to penetrate the electric grid or the transportation world for a while to come,” said Michael J. Picker, president of the California Public Utilities Commission. Part of this speed comes down to the fact that California already has several storage projects in the works, some of which involve Tesla. On the other hand hey, it’s Tesla. If anyone knows their way around batteries, it’s got to be them — we come in at a close second, though. The company designed and built all the important parts — the batteries themselves, support systems, and all the equipment — in independent modules inside the battery packs, ready to be shipped wherever they’re needed. “Essentially, we can go and pour a slab and install the basic wiring, but each one of our Powerpacks is quite self-contained,” All of the batteries, cooling and safety systems, and other equipment are inside the casings, ready to load onto delivery trucks. Compared to power plants, batteries are more flexible and don’t require complex infrastructure, such as water or fuel pipes. That also means they don’t need to get environmental permits for said infrastructure, so they can be set up much faster and with less red tape than conventional reactors. And California’s efforts now will only reduce storage costs for the rest of us, so battery storage stations just like this one might pop up in a town near you pretty soon.